This beautiful apartment with portable air conditioner, is located in a private house with 2 other apartments. It has breath-taking sea view from the terrace over the Vinkuran bay. With 1 bedroom and a double sofa bed in the living-room, this apartment is ideal for 4 persons. The spectacular natural beaches of the Nature Park of Kamenjak are only 5 minutes away. The 3000 year old Roman town of Pula, with it's unique Roman Amphitheater, is only 5 minutes away by car. Visit the famous Roman ruins throughout Pula on the days that you take a break from the sea. In Pula with Internet, Air conditioning, Washing machine (362837). The accommodation APP GREEN is located in an ideal place for your stay in Pula. This charming accommodation is located on floor 2 and offers Wifi, Air conditioning and Heating. 271 m from the center of Pula with Internet, Air conditioning, Parking, Balcony (700447). 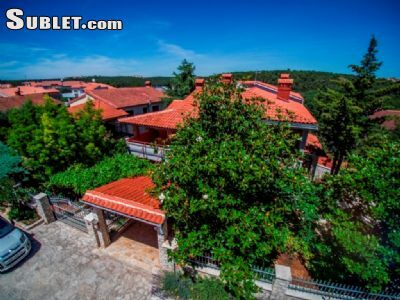 One-bedroom apartment Jukan of 50 square meters is located in a house situated 1 km from the town center, 4 km from the sea and 3 km from Pula airport. Apartment in Pula with Seaview, Loggia, Air condition, WIFI (3616-1). Located in Medulin. Sublet.com Listing ID 3514389. For more information and pictures visit https:// ... /rent.asp and enter listing ID 3514389. Contact Sublet.com at ... if you have questions. Located in Medulin. Sublet.com Listing ID 4096998. For more information and pictures visit https:// ... /rent.asp and enter listing ID 4096998. Contact Sublet.com at ... if you have questions. Located in Medulin. Sublet.com Listing ID 4096959. For more information and pictures visit https:// ... /rent.asp and enter listing ID 4096959. Contact Sublet.com at ... if you have questions. Located in Medulin. Sublet.com Listing ID 4094275. For more information and pictures visit https:// ... /rent.asp and enter listing ID 4094275. Contact Sublet.com at ... if you have questions. Located in Medulin. Sublet.com Listing ID 4096949. For more information and pictures visit https:// ... /rent.asp and enter listing ID 4096949. Contact Sublet.com at ... if you have questions. This apartment with sea view is located on the promenade in the lively resort of Medulin and is ideal for beach lovers. You'll find the sandy beach at already 200 m! You can park your car in front of the apartment house, because everything you need is within walking distance. In the immediate vicinity you will find restaurants, cafes, a harbor, shops and terraces. If you want to go out anyway, the city of Pula (10 km) is recommended to visit. The apartment is situated on the first floor and simply furnished. You'll have a living room with air conditioning, sofa bed, dining table and kitchenette, a bedroom, a bathroom and a balcony with seating and sea view at your disposal. Located in Medulin. Sublet.com Listing ID 4094276. For more information and pictures visit https:// ... /rent.asp and enter listing ID 4094276. Contact Sublet.com at ... if you have questions. This apartment with sea view is located on the promenade in the lively resort of Medulin and is ideal for beach lovers. You'll find the sandy beach at already 200 m! You can park your car in front of the apartment house, because everything you need is within walking distance. In the immediate vicinity you will find restaurants, cafes, a harbor, shops and terraces. If you want to go out anyway, the city of Pula (10 km) is recommended to visit. The apartment is situated on the second floor and simply furnished. You'll have a living room with air conditioning, sofa bed, dining table and kitchenette, a bedroom, a bathroom and a balcony with seating and sea view at your disposal. The studios and apartments in the resort Aparthotel Del Mar may be situated on various levels of this colourful complex. The well maintained and comfortably furnished accommodations are set up for various numbers of people. You can chose from types for 2, 3, 5 and 5 persons, as well as between two types for 6 persons. All of these types are available in three "locations", namely: street side, sea side and sea view. A 6 person apartment can also be booked with an inland view. You have a terrace or a balcony. This 6 person apartment (HR-52100-76) has a sea view. The studios and apartments in the resort Aparthotel Del Mar may be situated on various levels of this colourful complex. The well maintained and comfortably furnished accommodations are set up for various numbers of people. You can chose from types for 2, 3, 5 and 5 persons, as well as between two types for 6 persons. All of these types are available in three "locations", namely: street side, sea side and sea view. A 6 person apartment can also be booked with an inland view. You have a terrace or a balcony. This 6 person apartment (HR-52100-73) is located on the street side. The studios and apartments in the resort Aparthotel Del Mar may be situated on various levels of this colourful complex. The well maintained and comfortably furnished accommodations are set up for various numbers of people. You can chose from types for 2, 3, 5 and 5 persons, as well as between two types for 6 persons. All of these types are available in three "locations", namely: street side, sea side and sea view. A 6 person apartment can also be booked with an inland view. You have a terrace or a balcony. This 4 person apartment (HR-52100-68) is located on the sea side. The studios and apartments in the resort Aparthotel Del Mar may be situated on various levels of this colourful complex. The well maintained and comfortably furnished accommodations are set up for various numbers of people. You can chose from types for 2, 3, 5 and 5 persons, as well as between two types for 6 persons. All of these types are available in three "locations", namely: street side, sea side and sea view. A 6 person apartment can also be booked with an inland view. You have a terrace or a balcony. This 4 person apartment (HR-52100-67) is located on the street side. Located in Medulin. Sublet.com Listing ID 4038825. For more information and pictures visit https:// ... /rent.asp and enter listing ID 4038825. Contact Sublet.com at ... if you have questions. Located in Pula. Sublet.com Listing ID 4119244. For more information and pictures visit https:// ... /rent.asp and enter listing ID 4119244. Contact Sublet.com at ... if you have questions. The mobile homes are on a private, enclosed plot of land. They have been recently placed in position. They are well-maintained and have modern interiors. All have air-conditioning and charges apply. Type HR-52203-01 are in a central position in the park and are slightly further from the sea. This apartment will guarantee a wonderful holiday in Croatia. You'll find this attractive, luxury apartment at 100 metres from the sea, in one of the most beautiful bays of the tourist town of Pula. Enjoy the views across the sea while you're working on your tan on your sunny terrace. The apartment has a modern and attractive interior. The modern kitchen includes an electric oven and a dishwasher. Enjoy a beautiful sunset on the spacious balcony, for example after a pleasant day of shopping in Pula. You can find shops and restaurants within walking distance. There's a small pine forest of around 100 metres, halfway between the beach and your apartment - ideal for when you want to escape the sun for a bit. One kilometre further on is the town centre of ancient Pula, which is the most southern town of the Croatian peninsula of Istria. Culture lovers will find plenty of interesting things to do including a visit to the splendid amphitheatre and the Arch of the Sergii. Or take a boat trip to the Brijuni Islands, which is a great place for diving and snorkelling.